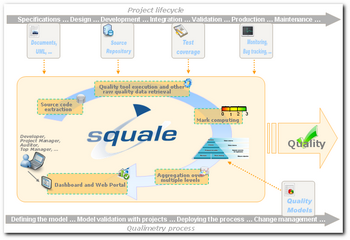 Squale - Squale: the open source quality and qualimetry project! Welcome to Software QUALity Enhancement! Download and give Squale a try! 26 may 2011: The Squale team is pleased to announce Squale 7.1, which brings new functionalities and improvements! Give it a try! 1 sep. 2010: The Squale team is pleased to announce Squale 7.0, which brings new functionalities and improvements! Give it a try! 2 apr. 2010: The Squale team is pleased to announce Squale 6.0, which brings new functionalities and performance improvements! Give it a try! 09 mar. 2010: The Club Qualimétrie, which is run by Qualixo, was honored to welcome Thomas McCabe, the father of the famous Cyclomatic Complexity metric, for a special session where he presented a state of the art of software quality and an overview of his most recent research works on software security. At this occasion, Laurent Bouhier and Fabrice Bellingard talked about the Squale project, which intensively uses McCabe metrics. Assist developers in improving the code of their projects. Help project managers to meet quality requirements for their applications. Give top-managers dashboards to monitor the overall health of their information system. This is what the Squale project is all about. Squale 7.1! Please go to the release notes to know more about this version and give Squale a try with its standalone version! Squale is an open-source project! Squale Application is developed and distributed under the terms of the GNU Lesser General Public License version 3. Squale Quality Model research documents are licensed under a Creative Commons Attribution-Noncommercial-Share Alike 3.0 Unported License. After being supported and labeled by the System@tic Paris-Region competitive cluster in its Free/Libre OpenSource Software group, Squale was selected in the	5th FUI call for projects at the end of year 2007. The project officially started in June 2008, and is now on the road. The first official open-source version was released in January 2009.